Tha Tormod MacLeòid ann an deagh àm leis an aiste seo mu litreachadh caochlaideach “bi/bidh/bith” agus “cuir/cur”. Ged a tha e gu math pongail, thuirt e gur e “incoherent rant” a th’ ann, agus mar sin, chuir sinn i ris an roinn againn, “Rabhd na Bliadhn’ Ùir'” (air atharrachadh am-bliadhna gu Rabhd na Callainne). Carson a tha barrachd air aon ‘bi’ ann? Innsidh iad dhut gu bheil trì diofar sheòrsaichean den fhacal ‘bi’ ann agus gu bheil adhbharan ann air an son. Mura h-eil sibh eòlach orra, bheir mi seachad geàrr-chunntas glè luath, agus dh’fhaodadh gun dèan mi mearachd no dhà. An toiseach tha ‘bidh’ ann, ’s e gnìomhair neo-eisimeileach a th’ ann, an uair sin gheibh thu ‘bi’ ann, ’s e gnìomhair eisimeileach a tha seo (dè an t-adhbhar airson dà litreachadh? Cò aig a tha fios), agus mu dheireadh tha ‘bith’, ’s e ainmear a th’ ann am ‘bith’. Tha barrachd nan lùib ach ’s e blasad a tha sin dhen chùis. Tha mise a’ faireachdainn nach eil fhios aig a’ mhòr-chuid de Ghàidheil air na riaghailtean seo, daoine aig an robh Gàidhlig bho riamh agus daoine aig a bheil comas sgrìobhaidh sa chànan cuideachd. Dh’fhaodadh a ràdh gur e fàilligeadh san fhoghlam a tha seo ach ’s dòcha gur e fàilligeadh a th’ ann do shaoghal an oideachaidh. Nach bu chòir dhuinn a bhi a’ feuchainn ri cùisean a dhèanamh nas fhasa dhan Ghàidheal àbhaisteach gus am bi iad a’ faireachdainn nas cofhurtaile le bhith a’ sgrìobhadh sa chànan aca fhèin? Tha mise a’ smaoineachadh gum bu chòir co-dhiù. 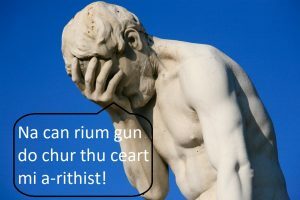 Canaidh daoine gu bheil na ‘bithean’ seo a’ ciallachadh rudan eadar-dhealaichte agus le sin gum bu chòir dhaibh a bhi air an sgrìobhadh ann an dòighean diofraichte; ach a bheil sin ceart? Tha kettle agus blame air an sgrìobhadh san aon dòigh sa Ghàidhlig, ‘coire’, ach chan eil sin a’ fàgail daoine mì-chinnteach ann an seantansan dè an tè a th’ air a chleachdadh, a bheil? Tha cuideachd ‘Mòr/mòr’, ‘na’, ‘nan’, ‘èideadh’ agus ‘mìle’ am measg gu leòr eile ann. ’S an uair sin tha an argamaid ann a thaobh mar a tha thu a’ cantainn na facail seo. Tha ‘bidh’ air a chantainn ann an dòigh eadar-dhealaichte ri ‘bi’ (no bu chòir) agus ‘cur’ agus ‘cuir’ an aon rud (ged a tha seo a’ falbh beagan nam bheachd-sa) ach, a-rithist, nach eil ‘coire’ an aon rud? Ann am Beurla tha tòrr fhacail ann a tha air an sgrìobhadh anns an aon dòigh ri facail eile ach a tha air an ràdh ann an dòighean eadar-dhealaichte cuideachd, seo feadhainn dhiubh: read, live, tear, bow, row, close, lead, polish. Tha tòrr a bharrachd air-loidhne ma tha sibh airson an coimhead an-àird. Mar a dh’ainmich mi shuas, tha mi cuideachd den bheachd gu bheil an aon rud fìor mu dheidhinn ‘cur’. Tha dà dhòigh ann ‘cur’ a’ sgrìobhadh, ‘cuir’ mar an t-òrdugh agus ‘cur’ mar an t-ainmear gnìomhaireach agus mar sin air adhart. A-rithist, dè am feum a th’ ann? Chan eil ann ach na h-aon h-adhbharan ’s a bh’ ann gu h-àrd. Nis, chan eil mi a’ feuchainn ri daoine a chàineadh no bhith gan dèanamh fiadhaich, ’s e còmhradh/deasbad a tha mi ag iarraidh. ’S dòcha gu bheil thu ag aontachadh gu tur leam, ma tha – glè mhath, ’s dòcha gu bheil sibh ag aontachadh gu ìre – mar as dòcha gu bheil sibh a’ tuigsinn carson a bhiodh aon ghnìomhair math ach gum bu chòir ‘bith’, an t-ainmear, a chumail – air neo ’s dòcha gu bheil sibh gu mòr nam aghaidh agus tha sin ceart gu leòr cuideachd. Mar a thuirt mi, ’s e an còmhradh an rud as cudromaiche. Chanainn aon rud ge tà, cuimhnich gum feum cànain a bhi a’ gluasad agus ag atharrachadh gus a bhi beò agus mura biodh atharraichean air a thighinn a-steach dhan chainnt againn fhìn, nach e cànan na h-Èireannaich a bhiodh againn san latha an-diugh. (Agus gu dearbh tha fhios agam gur e ‘nan Èireannach’ a bu chòir a bhith ann ach ’s e lecture na croich eile tha sin airson àm air choireigin eile – siud agus asgairean na mollachd tha sin!). Co-dhiù, mar cho-dhùnadh bu mhath leam a ràdh gun do chleachd mi ‘bi’ agus ‘cur’ airson a h-uile suidheachadh a b’ urrainn dhomh anns a’ phìos seo. Sin a mholainn-sa a chleachdadh an-còmhnaidh. Tapadh Leibh. Incoherent rant over. Cho fad ’s as aithne dhomh chan eil fuaimneachadh “bidh/bith/bi” eadar-dhealaichte ach tha diofar eadar “Bidh” agus “Bithidh” a thaobh beum. Cuiribh ceart mi ma tha fios nas fheàrr agaibhse. “A bhith no gun a bhi”, ’s e sin a’ cheist. Och, cha bhiodh adhbhar-blogaidh aig Gilleasbuig Aotrom ann, mura b’ e chur/chuir charnage!